Make sure you buy RAW buckwheat. This may sound silly, but in certain countries, like Russia, raw buckwheat is almost unheard of. I first found out that my Russian buckwheat wasn’t raw about 2 years ago, a year after I actually bought raw granola in the US and proceeded to cook it like I would with my usual one, Types of buckwheat turning it into a yucky gooey mess and grumbling to no end about “that strange American buckwheat” hahah! See the photo for the difference, raw buckwheat will be slightly greener than the roasted, brown buckwheat. In most European countries, you will find it only in organic/bio shops. After 12/24 hours, drain the water and wash the buckwheat in a colander. Leave the buckwheat in the colander over a bowl for the next 2 days. This is important – wash the buckwheat every few hours during those 2 days (give it a little “shower” whilst it’s in the colander). If you don’t have a chance to do it so often, twice a day also works, but no less than that or it will smell funny. Soon you will see that the buckwheat will produce little tails. These can get really quite long, I usually mark the buckwheat as “ready” when the tails are about 2-3cm in length. Set this aside in a huge bowl (I didn’t have a large enough one, so I used a wok) and prepare the rest of the ingredients. 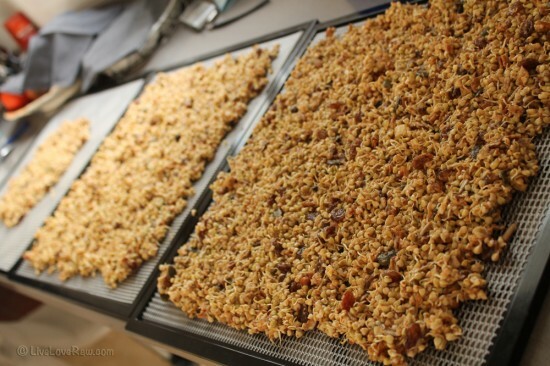 This is a vital step and cannot be missed out as this is what makes the granola stick together. Start by soaking the dates in some water (you can cheat by using hot water to speed things up). Mix the dates and the water in a high speed blender, such as a Vitamix until it forms a paste. Set it aside for the moment. The rest doesn’t need much, if you buy your almonds and walnuts whole, crush them into smaller pieces so they’re easier to bite. 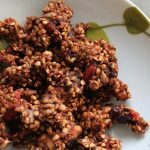 Mix the nuts, seeds, dried fruits and superfoods with the buckwheat (don’t squish, just use a spatula to gently mix it all). Finally, pour the date paste over the mixture and make sure its all even. Dehydrate for however long you wish using your dehydrator. Most recipes will say from 20-24 hours (flipping it over half way through). Personally I got used to doing it for 8 hours, this makes it go soggy after about 2 days, but in my family, it just doesn’t survive for longer so there’s no need to do it for longer 🙂 but if you like yours really crunchy, then please do dry it for longer. Once ready, break into smaller pieces and enjoy with either some home-made almond milk, put it into your breakfast fruit puree, or just eat as is! Anya Andreeva is a raw food chef and artisan chocolatier. Her passion lies in creating dishes that not only please the eye but nourish the soul. She has published a book with tips on how to live the raw vegan lifestyle with over 120 recipes. Anya has a keen interest in tantra and mindful living.